I really wanted to do something fun for the Halloween blog today, but couldn't think of anything too unique, so I decided to watch a "Climbing Horror Movie." ...but the horror elements were so bad and the story was so hokey, that nobody else possibly could have. There were several indicators that this film experience might not work out. The first and most obvious indicator was the title. But there were several other indicators in the first couple minutes of the movie. It was produced by IFC Midnight, which essentially is an indicator that it's going to be a B-level film from the get-go. Additionally, as the film opened, they showed glaciers and mountains, which would suddenly go from pristine to a filtered red at the same time they played jarring music. Oh yeah, and the film was dubbed too. I think it might have been made by Germans...or something. It's hard to tell while watching it. But it was indeed shot in the Alps. The bloody glacier in Blood Glacier. Click on the photo to expand it in its awful gory bloody glacierness. A group of climate scientists are studying glaciers in a remote corner of the Alps. They discover that a glacier appears to bleeding. Unbeknownst to them, the "blood" coming from the glacier is mutating the local wildlife. Essentially the bacteria in the substance creates hybrid animals. If an animal ate something, the new hybrid would have characteristics of both the host and the thing the animal ate. And of course the hybrid is born the same way an alien from the Alien franchise is born, by bursting out of the host's body. This presents a bit of a problem for the scientists. You know, because for some reason the prime minister is on her way up to the hut with the hero's ex-girlfriend and lots of other people to get attacked by hybrid blood glacier monsters. This movie was bad enough that I don't really expect many of you to see it. So I'm going to spoil it for you. If you don't want it spoiled. Don't read another word. Which is good because an infected dog licked the hero's blood and had a hyrbid dog-baby-thing burst out of it's stomach which the pair adopted as their own. For some reason this doesn't seem very plausible. So the story and the dialogue are both pretty laughable, but so are the monsters. It seems like we've been spoiled with monsters for several years on the big screen that look real. Some of these are done with CGI and others are done with puppetry and make-up. The most believable looking monsters actually use a combination of both. The monsters in this movie are so bad that it's hard not to laugh at them. They look like something that a high school drama scene shop with no budget might produce for a teenage haunted house. They're terrible...and kind of funny. Climbing is used so poorly in so many films, it often makes me nervous to hear that it was used in a given storyline. Think big climbing moves like Vertical Limit or Cliffhanger. But also think smaller films where climbing is used for a few scenes, like Mission Impossible II or Star Trek V: The Final Frontier. Inevitably, both genres of films are flops when it comes to climbing. The weakness in the climbing sequences make the whole films hard to watch. But then again, every now and then a movie comes around that gets climbing right...or at least a little bit right. Thus was the case for the British film, A Lonely Place to Die. A group of intrepid mountain climbers travel up to a remote part of the Scottish Highlands in order to attempt a series of technical climbs during their vacation. While approaching a climb through the woods, the team hears a faint voice. They follow the voice to a black pipe sticking up out of the ground. And this is where the movie devolves from a your standard "climber-falls-and-dies-injuring-another-climber's-psyche-for-life" climbing film. It quickly becomes clear that someone -- a child -- has been buried alive and that the pipe is her only means of air. The team of climbers quickly dig up the the person buried only to discover that it is a young girl who has been kidnapped and is being held for ransom. The remainder of the movie follows the climbers as they try to save the girl from gun-toting madmen who don't care who they kill as long as they get their ransom money. The thing is that these weird sequences are so minor that they don't really harm the storyline. I'm sure those of you that are sailors or police officers see these kinds of minor things in film all the time, but because they are not egregious, it's easy to suspend disbelief. Something that cannot be done for some of the glossier blockbuster-style climbing movies. 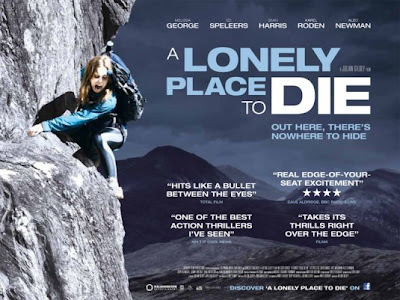 A Lonely Place to die is actually quite a good action movie style ride. The climbers simply are in the wrong place at the wrong time and this puts them into the middle of a violent conflict. The climbers don't just turn into action movie stars, they turn into victims. Their climbing skills provide little comfort when it comes to men with guns, and this gives the whole film a somewhat realistic feel. Climbers are not super-people, instead they are normal people with unusual interests. Such interests may make them hardy in the woods, but don't make them anything special against hardened criminals. 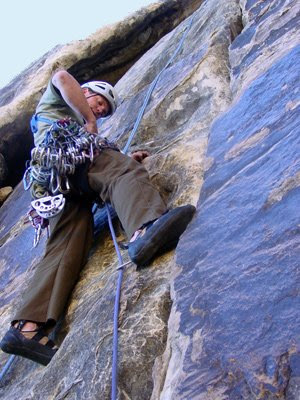 When a climber uses the term "toprope," he is referring to a technique wherein an anchor is set at the top of the cliff. A rope runs from a belayerat the base of the cliff, up to the anchor and then back down to the climber. As the climber ascends the wall, the belayer takes in rope through hisbelay device. If the climber falls, the belayer merely locks off his device, arresting the fall. This system is designed to stop the climber's fall immediately. Big routes in Zion National Park and in Yosemite National Park are commonly aided. These are the massive routes that sometimes requireportaledges or bivies on the wall. Big wall aid climbing is in many ways analogous to vertical backpacking. And while most big wall climbs require some free climbing, they tend to lean toward direct aid. In this video, Climbing Coach Taylor Reed shows some of the techniques he teaches to the Columbus, Ohio climbing team. Specifically, Reed deals with some of the most common injuries. First, he discusses crimping (something I've personally been injured doing several times). Second, he deals with shoulders. And then finally, he deals with fingers and wrists. One thing he doesn't say, that he might just think is self-evident, is that when you climb hard, you should always, always warm up. If you don't, you will get injured. 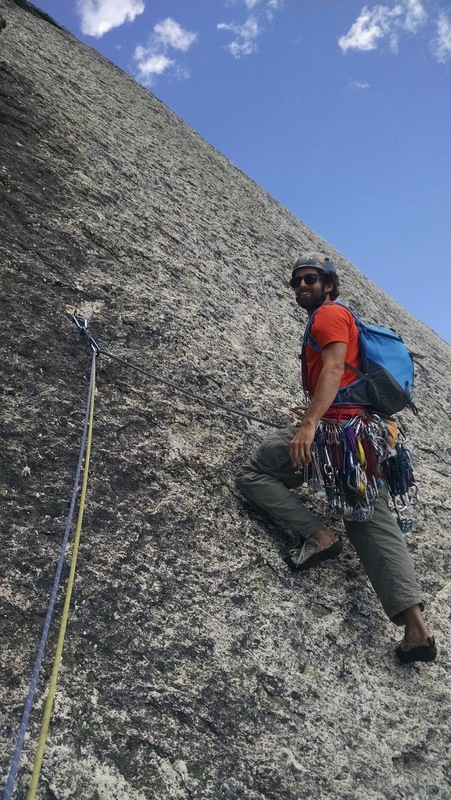 The following is a series of etiquette oriented questions that arise around toproped climbing at popular cragging destinations. The answers to these questions should be adhered to at North American Climbing destinations. Locations outside of North America may have different etiquette issues. 1) Where should I set-up my "camp" at a crag that I'm going to climb at all day? Gear and equipment should not be placed directly under the wall. It's good to set-up a "safe" area away from the wall where you can relax without a helmet on and eat lunch. This will also keep the base of the wall from being crowded with gear and packs. It's a good idea to consolodate your group's gear. Avoid allowing equipment and packs to be scattered around. 2) What if I have a large group and want to "take-over" a crag for the day? It is not appropriate for a group to "take-over" a crag. Climbing areas are public areas that are open to everyone. As such, it is incredibly rude for a group to hold an entire area -- or even a few routes -- hostage for the day. If you have a large group, you have a large impact on both other users as well as the area. The best thing that you can to mitigate that impact is to keep a low profile, allow others to work in on the wall that you're using. Never leave a rope up that is not being used to "hold" a route. If you do have a lot of ropes up and other users wish to climb routes that you have ropes on, it is okay to allow people to use your ropes if they look like they know what they're doing. If they don't appear knowlegable and they are climbing on your gear, you could become legally liable if something happens to one of the climbers that aren't with your group. 3) What if a large group is using a crag and refuses to give up a climb to my small group? If you've got moves, then offer to have a dance-off for the climb. Seriously, joking with people will often loosen them up. In most cases, people that have had a good laugh will be more polite and more open to allowing people to climb. If the large group is very rude and refuses to give up a climb, then politely find another place to go. It's not worth lecturing an ignorant climber about crag ettiquete. More often than not, a lecture will just reinforce negative behavior. 4) Is it okay to use the same anchor bolts as the person on an adjacent route? Yes and no. Will this cause the person next door problems? If so, they were there first. If not, then be sure to ask them before clipping in next to their carabiners. If they say yes, then clip the bolts, but be sure not to do anything that changes their set-up in any way. 5) Where should I go to the bathroom when I'm cragging? If there is an outhouse nearby, always use that first. Avoid urinating at the base of the wall and always avoid urinating in cracks on a wall as this causes the smell to linger. If you have to defecate, know the rules of the area. Some areas require the use of WAG Bags, while other areas require you to dig a cat hole and pack out your toilet paper. Never go to the bathroom on the ground, stack the toilet paper on it and then put a rock on top. 6) When should I say something to a person who is doing something dangerous? This is up to you. I usually don't say anything unless there is real and iminent danger. If there is mild danger, I will usually chat with the people for awhile in a non-threatening way before providing any unsolicieted beta. 7) Is it okay to toprope the first pitch of a multi-pitch climb? More often than not, the answer is no. This is a more complex issue than the others and it does depend on the route and the route's history. People who are doing multi-pitch climbs always have the right of way over those who will TR a climb. Some climbs are multi-pitch climbs, but nobody does anything but the first pitch. In this case, all the other ettiquete rules apply. Other climbs are commonly climbed as multi-pitch routes and are seldom done as single pitch routes. Such climbs should not be toproped. 8) It it okay to yell beta at people who didn't ask for it that I don't know? No, many climbers like figure out the moves on their own. Climbers who keep these concepts of etiquette in mind will almost universally have a much better time with a lot less conflict at the crags. And climbing isn't about conflict. It's about having fun...! We have talked about extending a rappel in this blog before. However, to date we've been too lazy to make a video on the subject. This is not the case with Climbing magazine's gear editor Julie Ellison. Julie made a very nice video on the subject of rappel extensions. There are a handful of additions that I'd like to make to Julie's notes. It is important that the sling is girth-hitched through the tie-in points on the harness. It should not be girth-hitched around the belay loop. This is because a girth-hitch crushes the loop and slowly wears it out. Some choose to keep a PAS or a daisy chain attached to their belay-loop on a more or less permanent basis. This is very dangerous as it freezes the belay-loop in place, keeping it from rotating. The natural rotation of the gear-loop allows wear to disperse around the loop. When something is permanently girth-hitched to it, all the wear is focused into two places, wearing out the loop faster. To avoid this, we recommend girth-hitching through the tie-in point. Julie shows the clipping of the device inside the loop between the harness and the rope. To create additional redundancy in the system (at least while rappelling) it is possible to clip the device into both loops. That way, when you clip the end of the system back to yourself, you have a level of redundancy. In the video Julie is using a Dynema sling. These slings don't do well in a factor two fall. A factor two fall could take place when you clip into your anchor above your anchor, and then slip. In tests completed by DMM, Dynema slings did much more poorly than nylon slings. To see a video concerning this, click here. Our recommendation is generally to use nylon slings in this application. But if you have to use Dynema, then you should be cognizant of this danger. Julie shows clipping this into your belay loop, which is the correct place to clip the autoblock. 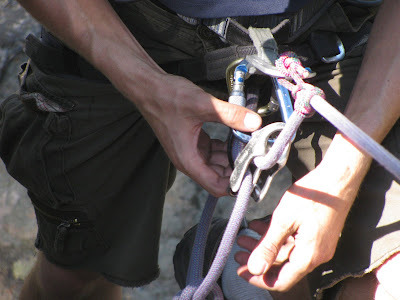 However, many people clip it to their leg-loop when they extend the rappel. There is no reason to do this. 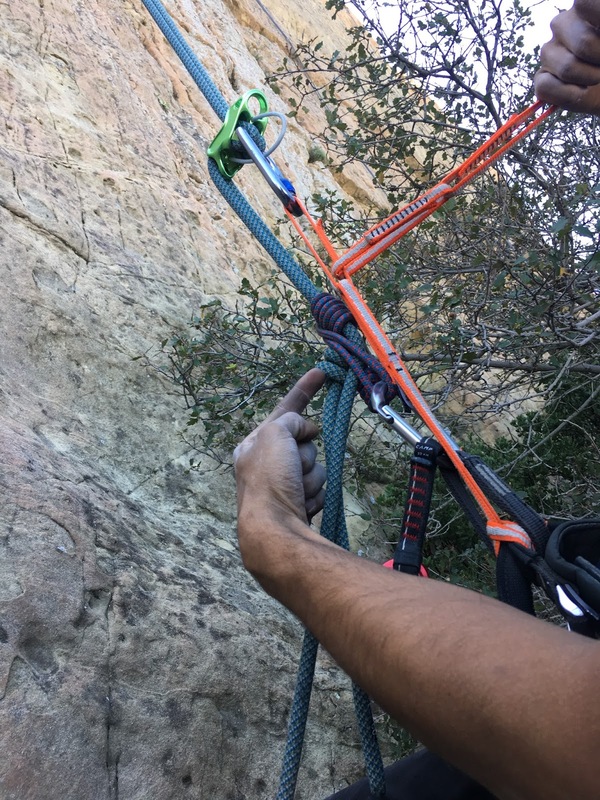 If your belay loop is clear, why wouldn't you clip the autoblock to it? It's the strongest part of your harness. Julie does make one off the cuff comment about how your autoblock will save you if you let go. Indeed, that is the intent of the third hand. However, if the autoblock is loose or sloppy, it may not engage appropriately. As such, I generally still wrap the rope around my leg or tie a catastrophe knot below the autoblock in order to have some peace of mind when I have to go hands free. One thing that was not mentioned in the video is that the use of extended rappels in a multi-pitch setting allows more than one person to clip in at the same time. This can significantly expedite a descent and also allows you to check one another to ensure that everything has been set-up right. --The 2018 Mid-Term Elections are fast approaching. 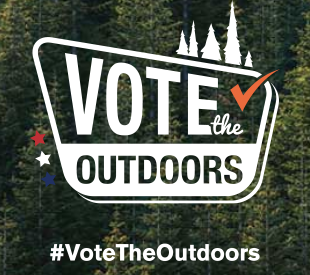 The Outdoor Industry Association has released a comprehensive voters guide to help people across the country make informed choices about who cares about the outdoor industry, public lands and climate change. To read more, click here. --At about 1:30am on October 11, AAI's Technical Rope Rescue Comprehensive program was awakened by Bellingham Mountain Rescue volunteers. Guides and participants sprung into action to help a shoeless hiker and his dog that were stuck mid-face on a rotting moraine. An AAI guide performed a pick-off to rescue the victim, while other rescue personnel retrieved the dog. Another AAI guide made shoes for the victim out of his ripped up sweatshirt, a cut-up z-pad and ace bandages. To read more, click here. --A climber was severely injured after sustaining a 65-foot fall in the San Juan National Forest. Information about what lead to the accident and the victim's current condition is scarce. To read more, click here. --Here are the projected opening dates for all the Colorado Ski Resorts. --Rock and Ice is reporting that, "nine climbers died in an accident at the base of Gurja Himal (7,193 meters), Nepal, on Friday, October 12, in what was the greatest loss of life in Himalayan climbing since the 2015 avalanche that killed 18 people on Everest. The dead, all from the same expedition, numbered five South Korean climbers and four Nepali climbers. The expedition had hoped to forge a new route to the top of the infrequently attempted Gurja Himal, and to name the route 'One Korea — Unification of North and South Korea.'" To read more, click here. --The Casper Star Tribune asks and then answers, "what’s the best way to celebrate the landmark of your 91st birthday? For Dr. Bill Weber of Florida, the obvious answer was to break a record and become the oldest known person ever to have climbed to the summit of Devils Tower." To read more, click here. --The Access Fund has identified several of our favorite places to climb as being under serious threat. They just produced their 10 Climbing Areas in Crisis report. To see it, click here. --In other Access Fund news, they have recently selected several places for bolt replacement and have donated $10,000 to the fund. To read more, click here. in Red Rock Canyon National Conservation Area. --Craft beer is a ubiquitous part of outdoor culture. But what about beer made from climbing chalk...? Yeah. Somebody did it. And Climbing has the story, here. --The first ever Olympic medals were given out to climbers recently. The Youth Olympics included climbing in its Buenos Aires events. To read more, click here. --And finally, Outside argues that you should let your kids participate in extreme sports. "Experts say intense outdoor activities can help children increase focus and develop a better awareness of their surroundings." To read more, click here. Rack on the Shoulder or Shoot from the Hip? Why would you subject yourself to a shoulder sling, you might be asking? sporting a shoulder rack on a multi-pitch climb. Easy, there are a number of advantages to racking on a shoulder sling. 1) It's easy to shift a shoulder sling from one side of your body to the other when climbing off-widths or chimneys. 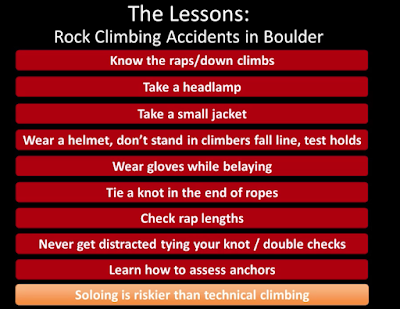 2) When you climb sport routes, nothing changes on your harness. 3) It's very easy to swap leads by handing the rack to your partner. Indeed, on some speedy ascents, we actually used to hold the sling out so the climber following the pitch would climb right up into the sling and then keep going...! 4) It's easy to see the gear that you have on your rack. Nothing is hidden on a gear loop at the back of your harness. 5) In steep snow, with a lot of clothing, it may be easier to find gear on a shoulder sling. But there are also a lot of disadvantages. 1) A large rack rubs your shoulder and neck raw. It can be very painful to carry doubles or triples. 2) On low angle terrain, the rack constantly gets in your way. It's hard to see your feet. 3) The edges of cams commonly get caught on edges while you're climbing, making it difficult to move efficiently. 4) Shoulder slings with fixed loops tend to change positions on your shoulder. Heavier gear constantly pulls the rack into inopportune positions. 5) If you fall and flip upside down, it's possible to lose the entire rack. If you look at the advantages and disadvantages of a shoulder sling, it starts to feel like it's about even. There are five advantages and five disadvantages. But choosing whether to use a shoulder sling or to "shoot from the hip" isn't so much about the advantages and disadvantages of the shoulder sling, it's also about the advantages and disadvantages of racking on your harness. A climber with a rack on his harness. 1) Nothing is rubbing on your neck or shoulder. 2) You can see your feet. Additionally, there's nothing in front of you, so it's easier to see mid-level holds. 3) The edges of your cams are less likely to get caught. 4) Ice screw clippers work extremely well on a harness, but don't work at all on a shoulder rack. 5) Everything feels cleaner and more streamlined when it's on your harness. 6) Most climbers use this system. This makes it easier to work with lots of different partners while having similar systems. 1) Depending on the harness, gear may be hanging in awkward places. This is especially true with harnesses that have offset gear loops. It can be problematic when cams are hanging over the front of your thigh. 2) It's harder to swap gear between leads. 3) It can be hard to see which cam is which at your waist. I personally rack my cams with carabiners of corresponding color to easily find what I need on my gear loop. 4) There may not be enough space on the gear loops to accommodate all the gear required for a lead. How you rack is ultimately a personal choice. But I do lean toward racking on the harness. The main reason for this is because I did rack on my shoulder for over twenty years. I didn't want to change. But when I finally committed to updating my system, I found it to be much more streamlined. If you're new to climbing, I would strongly suggest that you try both systems. There is value to being able to accommodate different systems for different kinds of climbing. But ultimately, you're going to lean toward one system that you use most of the time. These days, it's highly likely that you'll lean toward "shooting from the hip." However, if you decide that the shoulder sling is better, there's nothing wrong with that. How you climb is completely up to you...that's one of the cool things about this sport! The bear climbed up through the window. Garschhammer chopped at the angry animal with her hatchet until it retreated. It was then that she was able to close the shutters. Ruppert survived. The bear did not. It is very rare for a black bear to attack a person, and there are really no other stories out there about a bear that attacked people inside a tent. So after game wardens hunted down the animal and killed it, they performed an autopsy. Scientists could only come up with one conclusion about the aggressive nature of the animal. They believed that it was mating season and that the animal was...frustrated. 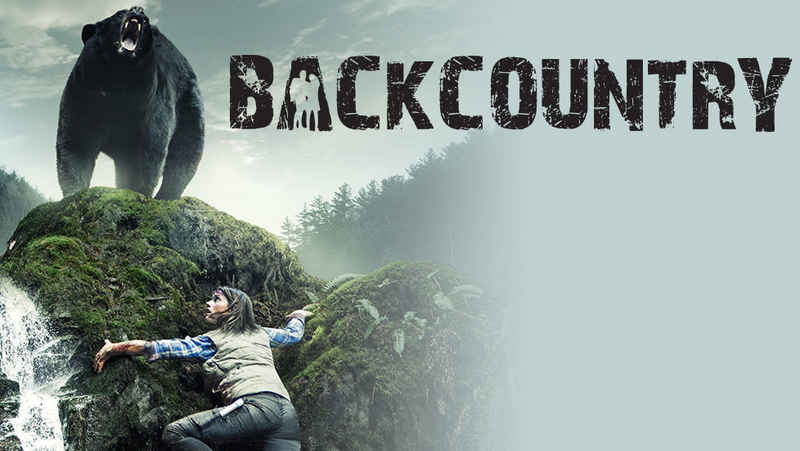 In 2014, writer/director Adam MacDonald loosely based his film Backcountry on the 1994 attack. The film, while not really a horror movie, provides the viewer with an intense and often terrifying roller-coaster of an experience. A young urban couple travel deeply in the Canadian wilderness. Alex (Jeff Roop) is supposedly a seasoned backcountry traveler, while his girlfriend, Jenn (Missy Peregrym) is on her first camping trip. It turns out that Alex is not as seasoned as he thinks. He elects not to bring a map, which is a problem because the pair becomes seriously lost. Their problems are compounded by the loss of food, and then by an incredibly aggressive bear. And yes, just like in real life. The bear attacks the couple in the tent, and it is both terrifying and incredibly gruesome. The scene makes it feel like a blood and guts slasher film instead of a backcountry thriller. It is a very hard scene to watch. Both Roop and Peregrym are completely believable as a young inexperienced backcountry duo. They are also completely believable as people. They make a lot of mistakes (no map, didn't try to scare the bear away, no communication device, poor food storage plan, etc. ), but they're mistakes a lot of inexperienced backcountry travelers might make. You in no way feel that they deserve what happens to them. Instead, you are terrified by it and are rooting for them throughout the film. One thing that always drives me nuts about outdoor films are the packs. You can tell that there's nothing in them. Actors throw them around like they weigh nothing. One way to increase believability in all of these types of films is to put some actual weight inside the packs. Then the actors will actually look like they're carrying something. Packs aside, this is a pretty good outdoors film. The bear attack is gratuitous, but I suppose that's reality. Bears don't attack people very often at all, but when they do it's a big deal. And when they are so aggressive that they actively pull someone from their tent, that's a really big deal. A few years ago I was in a Nomad Ventures, the climbing shop near Joshua Tree National Park, when a question arose. "Do you use these?" my partner asked. Hand jammies seem like a good idea, but there's a problem with them. The problem is not that they don't work. The problem is not that they're too expensive. And the problem definitely is not that they're difficult to use. No, instead the problem is one of style. To put it simply, hand jammies are dorky. So lets follow this syllogism to its natural conclusion. A -- Hand jammies are dorky. B -- Gunther wears hand jammies. C -- Gunther is a dork. So my response was simple. "No, I don't wear those...at all." My partner turned to the clerk behind the counter and asked the same question, "do you wear these?" The clerk was a little less political in his answer. "No," he snorted. "I don't want to get beat up." Sometime later, something happened to me. I didn't take up hand jammies. No, instead I started to wear something a bit worse. I started to wear belay gloves. When you go out to the crag you'll notice that belay gloves are inot terribly common. The reason that they're uncommon is because most people don't see the need for them. Nobody really rappels or lowers anyone fast enough to burn their hands. And they certainly don't learn to wear them at the rock gym. I don't wear them to avoid hand burns. I wear them to avoid the aluminum that inevitably gets transferred from the carabiners to the rope and then subsequently to my hands. Over the last few seasons I've found it harder and harder to wash the tiny fragments of metal out of the creases in my hands and as such it always looked like my hands were dirty. I worked with a guide some time ago who was concerned that Alzheimer's disease comes from aluminum. As a result he always wore gloves whenever he handled a rope. A short time after the guide told me about this, we had our first baby. My wife felt that when I got home from work I should play with the baby, which I gladly did. But she also felt that the black smudges I left all over the baby's clothes were a bit much. A -- Belay gloves are dorky. B -- Jason wear's belay gloves. C -- Jason is a dork. --The biggest news this week is that we need to get serious about climate change. Things could be extremely ugly by 2040 if we don't do anything. To read more, click here. --The North Cascades was designated a National Park fifty years ago! To read more, click here. --Newsradio 560KPQ is reporting that, "Far from being a future threat, climate change already is making national parks hotter and the effects could get much worse, according to a first-of-its-kind study. Researchers went back to 1895 to chart temperatures and found they’re rising twice as fast in the country’s national parks as they are in the rest of America. The co-author of the study, a climate change scientist at Cal Berkeley, Patrick Gonzalez, says while the study makes stunning predictions for parks in the future, national parks like the North Cascades in Washington are in the midst of climate change right now." To read more, click here. --CNN is reporting that, "A California man was sentenced to five years in prison Monday for illegally starting a fire that burned nearly 10,000 square feet of historic trees and other vegetation in the Joshua Tree National Park." To read more, click here. --The search for a missing climber on Longs Peak was suspended yesterday due to weather. To read more, click here. --Quinn Brett, the Colorado based climber who was severely injured in a fall in Yosemite last year, is doing everything she can to get back to normal. The former climbing ranger is "working for the Rocky Mountain Conservancy, she is writing for Patagonia, making instructional Yoga videos for people with Spinal cord injuries, and as she did before her injury, helping with high alpine rescues." To read more, click here. 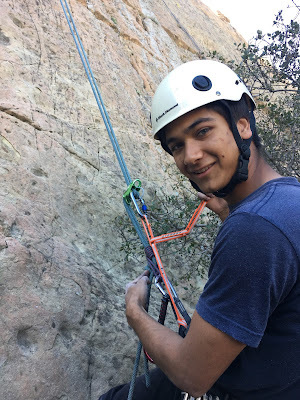 --The LA Times is reporting that, "Williamson Rock is a sheer granite wall that rises from chaparral in the San Gabriel Mountains National Monument. Crisscrossed with 300 routes, it has been a proving ground for Southern California rock climbers since the 1960s. But in a move that outraged many in the climbing community, the area was shut down in 2005 to protect an isolated colony of federally endangered Southern California mountain yellow-legged frogs from being trampled." To read more, click here. --A climber was bitten by a copperhead in Kentucky this week. To read more, click here. 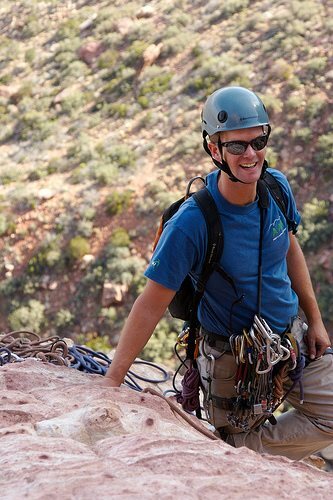 There is no doubt that rappelling is one of the more dangerous things that we regularly do in this sport. This is because we trust everything to one or two strands of rope and an anchor. If anything goes wrong, it can be catastrophic. However, there are some things that every climber can do to make rappelling safer. I have recently started to experiment with tying the ends of the ropes off and clipping them to my harness. 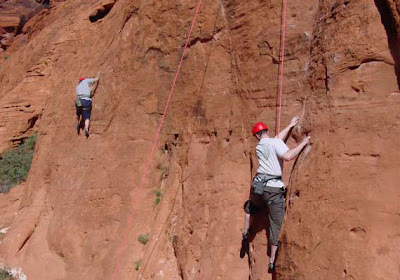 In a multi-pitch rappel setting this decreases the likelihood of ropes getting stuck below the next belay station, as well as providing the security of a closed system. Note the autoblock coming off the climber's leg-loop. Most people will put their hand on the autoblock hitch while rappelling. You might notice that the backup in this scenario is on a non-locker. Generally, you don't need a locking carabiner for a back-up, but if you want more security, you can certainly use one. Rappelling with a friction hitch above the device has gone a bit out of fashion. One advantage to rappelling with a prussik hitch above is that it is easy to switch a rappel system into a rope ascending system. 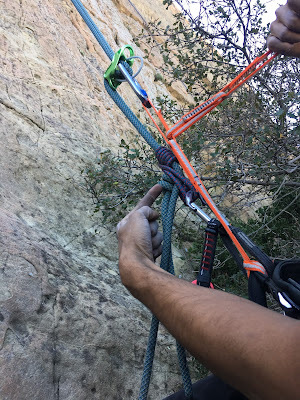 The prussik is already attached to the climber's belay loop, so all that he has to do is to add a second friction hitch for his feet below the first friction hitch. That said, in a free-hanging rappel, if the hitch gets loaded, it can be hard to release it. It's ******, ***** *****'s nephew, the kid you took climbing and lent a crash pad too. Hope all is well. Anyway, just wanted to share some photos! That knot you showed me saved a 4 foot fall due to miss judging how much rope i need for a rappel! This is a great example of why we should always close systems and use friction hitches to back up rappels! 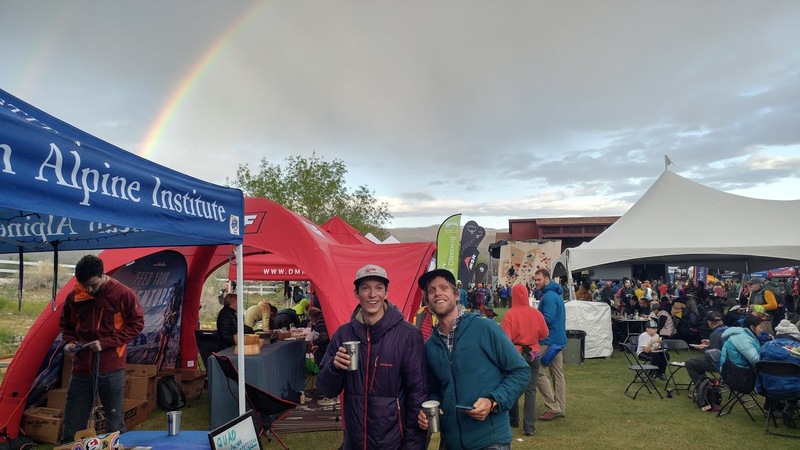 This video collaboration between the American Mountain Guides Association and Outdoor Research provides yet another excellent entry into their joint video catalog. In this particular video, AMGA Instructor Team Members Dale Remsberg and Olivia Race talk about some of the techniques they use to ensure that their racks are organized. Generally, I too will rack from big to small, back to front. One difference is that I often place the Stoppers and extremely large cams on the back loops of my harness. I started my career using a shoulder sling for all of my gear. I put all my draws on my harness. The theory was that my draws were going to be the same, no matter the route (sport or trad). Keeping it Light - Toothpaste Refills! Most of us carry small travel sized toothpaste tubes for personal tooth hygiene in the mountains. However, these little tubes do tend to run out of toothpaste quickly and they aren't always available when you need them. Here's a little tip. Refill your toothpaste tube. It's easy. Once your travel sized tube is out, simply place the nozzle of a normal sized tube up against the nozzle for the empty tube and squeeze...! Voila! Your tiny travel sized tube is full again. You can stay light and fast, while also keeping up on your dental health! The Rocky Mountain Rescue Group is the premier rescue organization in Boulder County. They do dozens of rescues in Eldorado Canyon, Boulder Canyon, and in the Flatirons every year. In 2012, the team wrote a research paper on the types of accidents that they respond to. Additionally, they put together a presentation for the general public on they types of rescues they participate in. 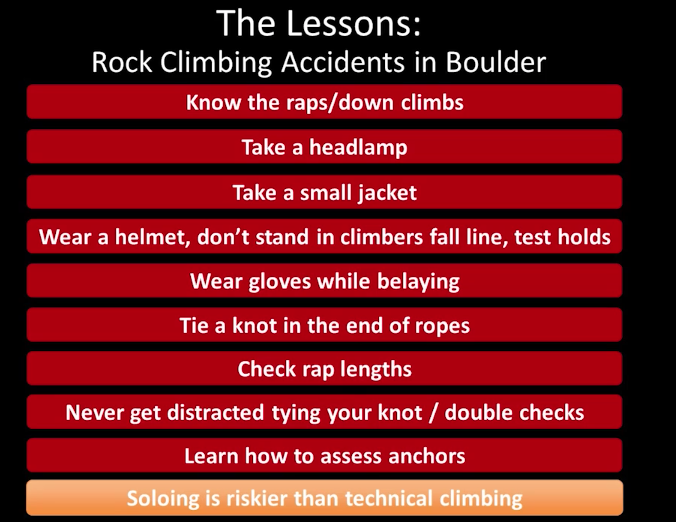 The presentation -- run by Rocky Mountain Rescue Members Dan Lack and Alison Sheets -- is incredibly informative and should be a required watch for every climber. It addresses all the things that you should and should not do to avoid an accident. Another point that is made during this presentation is that they don't charge for rescue. This is true in most places throughout the United States. If you think you need a rescue, call for a rescue. It's better to call and change your mind, than not to call and then need it. Mountain rescue units take a long time to deploy. And so, if you wait to call, the response time will be longer. Finally, remember that your local SAR or mountain rescue unit likely operates on a combination of donations and volunteers. You may not ever need them, but it's really good that they're there. Consider making a donation to your local unit, or even better, consider volunteering. Money is a good way to give back, but time is even better. The ability to understand mechanical advantage is an essential part of technical rope rescue, crevasse rescue and climbing self-rescue. The best way to begin an understanding of mechanical advantage is to understand how a toprope works. 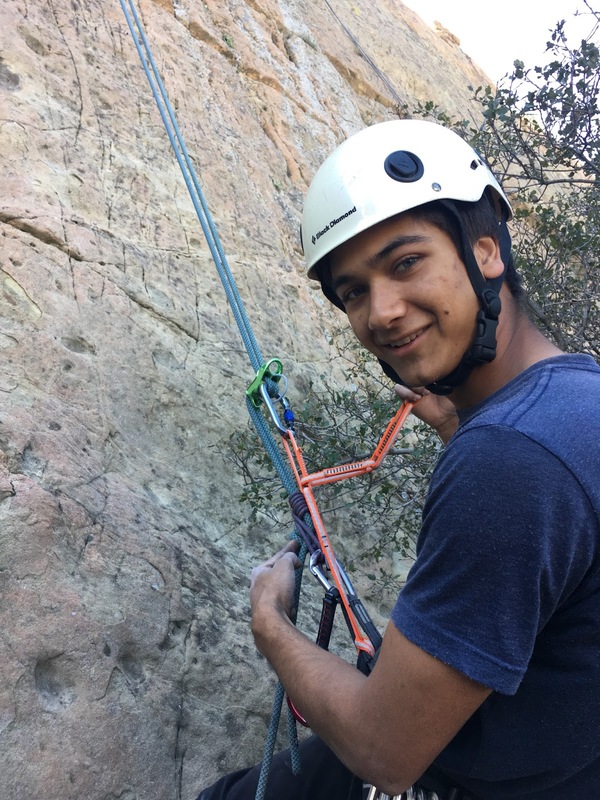 If a 150lb person is on one side of a rope, then a belayer has to provide at least 150lbs of force to keep the person from lowering to the ground. In order to make it easier to understand, we should consider the 150lbs as a unit of one. So to stop a unit of one from lowering, then an individual must put an equal amount of force on the other side, essentially a unit of one. The weight of 150lbs is arbitrary. The important thing to remember is that we have to put a unit of force on the opposite side to keep the first unit from going down. 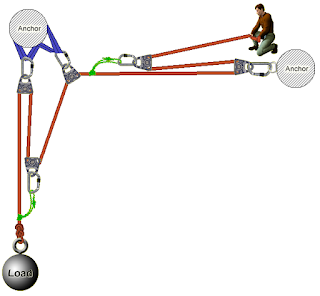 If there is one unit of force on one side, countering a unit of force on the other side, that means that there are two units of force on the anchor. on the left. There are two units of force on the anchor. 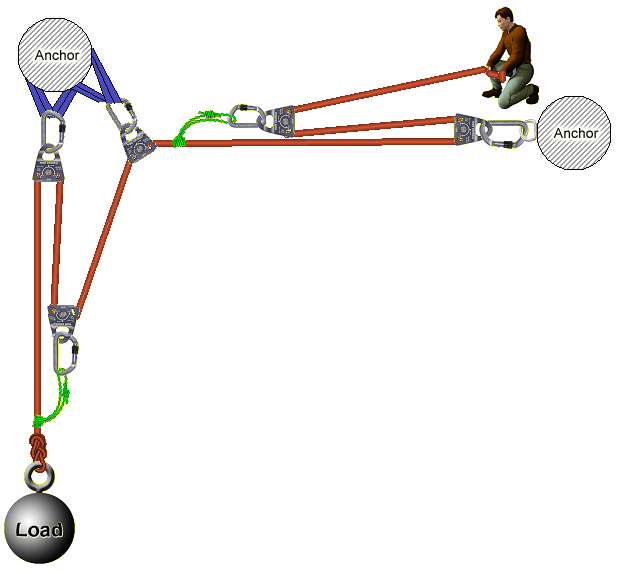 In this image, there are two units of force on the load, and one unit of force on the anchor. pulley, it exerts two units of force on the load. This is a simple 2:1 hauling system. To count out mechanical advantage, one should always start with the haul line and always start by counting it as a single unit. Traveling pulleys multiple mechanical advantage. attached. At the pulley with the prusik, there is a 2:1 mechanical advantage. The two in the traveling pulley are added to the one that follows the rope. This is a 3:1 simple system, commonly called a z-pulley system. In this image, the haul line is a unit of one. The upper traveling pulley is a unit of two. The unit of two travels on the lower line through the lower pulley, multiplying at the load. In this image, a 3:1 has been laid on top of a 2:1, creating a 6:1 compound system. is mirrored on the opposite side of the lower traveling pulley, creating a 6:1. It's important to note that the idea behind mechanical advantage is that pulleys and changes in direction theoretically decrease the amount of force required to haul a load. However, friction from rock or snow can increase the load. Don't scroll down any lower until you want to see the answers!